Welcome to the user guide for the new XenForo forum platform! This forum features major improvements over what you’ve previously seen, including increased security, speed, and extensibility. Our Community Staff has assembled this handy guide and FAQ to answer any questions that you might have while you’re navigating the new forum platform. There are some big changes between the previous forum platform and the XenForo forum. You’ll notice that a number of features have been tweaked or altered from their original state, and new, better functionality exists in many of the same places. Here are some common questions and answers you might have about the new platform. Will I have the same login as before? Yes! Your login credentials will be the same as they were under the previous platform. If you do experience issues with logging in, first, try the password recovery option. If all else fails, contact Community Staff at: community@tomshardware.com and we’ll get you squared away. What happened to the timeline? The older timeline is no longer available, and has instead been replaced by “New Posts” and “Trending Threads” features. What happened to the tags? Tags are still around! XenForo tags threads differently than the previous platform, but you can still add and edit tags on your threads. The primary sorting feature for threads in XenForo is categorical, rather than tag-based.nts for users. What happened to my badges? Badges from the previous forums are now known as “Trophies”, and a new streamlined reputation system has been implemented to incentivize participation and engagement. To show our gratitude for previous progress, all previous Best Answer counts from the prior forum are frozen at the point of the migration, and the tally is used to calculate a one-time, exclusive Legacy Trophy granted only at the dawn of the new forum. Existing and future Best Answers will count towards the progress of the new trophies in the new reputation system. Of note, as the basis of calculation for Best Answers has changed from tag-based to node-based, previous Best Answer counts may be different from the previous count. Tutorials are now known as the “Article” content type on the forum. Articles add a new experience to the forums, allowing you to rate, review, and leave comments for the creator. You can also add an expanded “About” section to showcase yourself as an Article author. Where are Editorial Comments? How do I comment on a news article? As the new forum software is not yet compatible with the existing news system, it will be a period of time before Editorial Commenting is re-connected to the forums. Re-establishing the connection between Editorial comments and the forums is a top priority for our development team. In the interim, we’ll be working to ensure that you have a place to continue discussing the latest news and events on Tom’s within the forums. Before you start exploring the forums proper, check out your Account Page. You can reach your Account Page at any time by clicking on your username at the top right corner of the page, and then clicking your username again from the drop down menu. The drop down menu also contains shortcuts to change your account details, password, and account preferences at the click of a button. You can access your private messages inbox directly from anywhere by clicking on the Inbox link at the top right of the page. 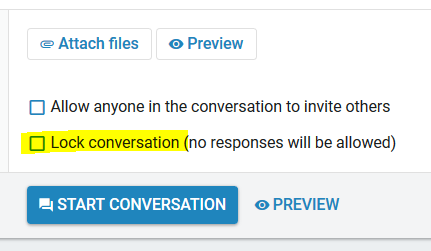 Private messages are called "Conversations." Most other boards split private messages into an "Inbox" and "Sent." In XenForo, "Conversations" are threaded for easier tracking, just like normal threads. All private messages to a user or users appear in a single thread, and you will always be able to see when your conversation was last read. You can add other members to your conversation and remove yourself from conversations as well. Can I invite more than one person to a conversation? Yes! 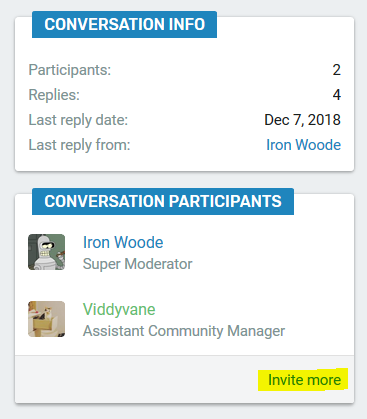 If you are able to invite more participants into a conversation, there will be an “Invite More” link in the right hand sidebar. You can start conversations with more than one person and invite others to join a previously created conversation, or even to conversations started by someone else if the OP has granted the proper permissions. If you are starting a conversation and do not want the recipient(s) to invite others in, do not tick this option. How do I receive emails for conversation replies? Click Contact Details in your user menu. Tick the box for 'Receive email when a new conversation message is received. What does locking a conversation do? When you start a conversation, there is an option to lock it. This means that no one can respond to your conversation. It will serve as a one-way message. How do I report a conversation for spam or abuse? Go to the message you want to report and click the report button at the bottom of the conversation. Bookmarks are an easy way to return to important threads for quick access in the future. 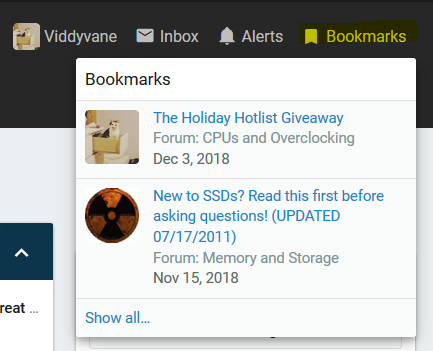 The bookmark feature functions as it would in any web browser, except instead of web addresses you’re bookmarking forum threads to be tracked in the forum. You can add new bookmarks by selecting the option to do so in an individual thread. The profile page is your personal public bulletin board, and allows you to post status messages, view your activity, create an About page, and show off all the trophies you’ve earned. 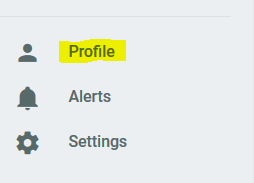 You can view profile pages belonging to other users by first clicking on a user’s avatar, and then their username. You can also leave publicly viewable messages on other user’s profile pages. 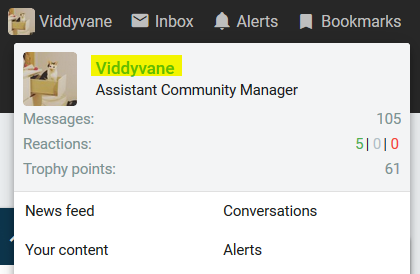 You can create status messages of up to 140 characters long to display on your profile page. Status messages are great way to leave a short update for other forum members, such as your PC build progress, interesting content, or a general heads up if you’ll be away for a short period of time. You avatar is the most visible aspect of your account and presence on the forums (short of your posts themselves) and is personalizable. You can upload your avatar on your profile page by clicking on the avatar icon or through Settings > Account Details. If you do not have an avatar, the default avatar for you will be a letter that represents the first letter in your username. 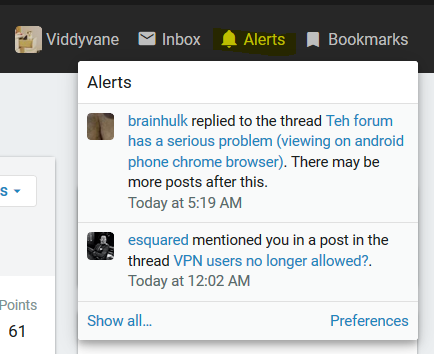 Alerts are forum notifications that alert you to activity throughout the forums. You can find alerts both on your Account Page or by clicking on the Alerts tab to the right of your username in the upper right corner of the page. Alerts can range from a response in your thread, a reply to your post, a trophy award or even if another user quotes your message. To customize what Alerts you receive, check out the Alerts Preferences page under Account. You can follow any user to keep track of their posts. Followers can be your friends or influential users you like to hear from. The list of users you follow populate this list and you can follow a user by clicking on their username and selecting "Follow." You can also curate who you are following in your Account Preferences or from the drop down menu. 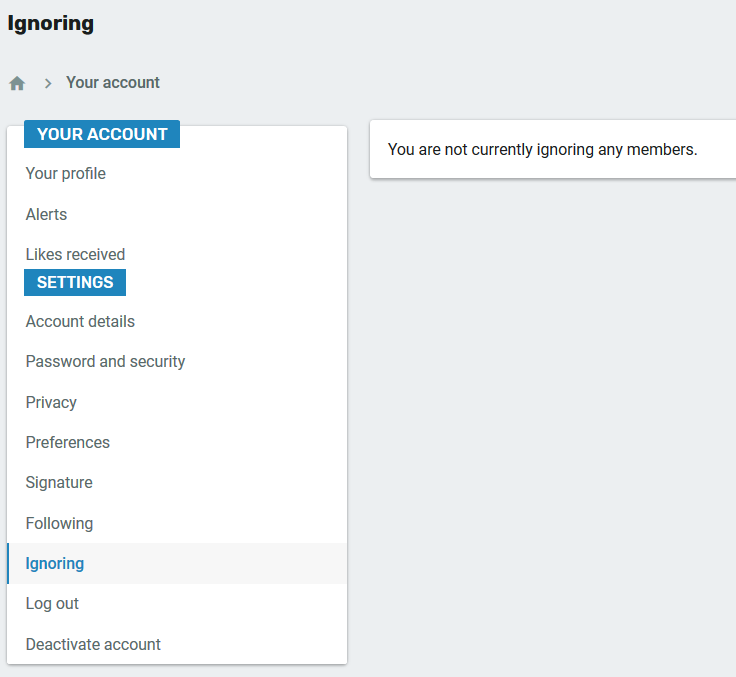 In addition to following, you can also Ignore users on the forums. By clicking “Ignore” the forum prevents a member’s posts or threads from being shown to you. You can also curate who you ignore on the forums through your Account Preferences. The Left Side Bar acts as a customized navigator to the forums! These simple shortcuts will help you find what you want and can be customized depending on which threads you watch, who you follow, and your Account Settings. How can I Collapse the Left Side Bar? Click the Collapse Menu Button or Hamburger Button next to the logo on the top left of your screen. The Home Button will take you directly to the forum homepage and main overview of forum categories.. The Forums Button has quite a few features! 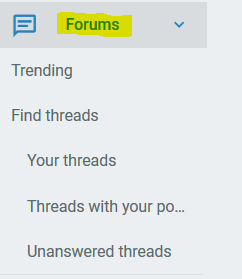 You can filter the main forum page by new posts or trending threads. You can also easily find your threads, threads you’ve posted on, unanswered threads, and threads you’re watching. Search Forums is the more detailed Search Function within the forums. You can search for threads, profile posts, tags, and threads or posts made by other users. 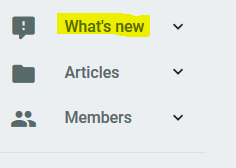 The What’s New Feature is another way to filter the forums. Instead of filtering by watched threads, What’s New let’s you look at posts and threads that are created by newest to oldest. You can also find your own news feed in the What’s New section. The Article Management System is host to our vast library of tutorials and user-submitted guides. From here you’ll be able to view, comment and rate other members’ articles and create your own articles for others to read. 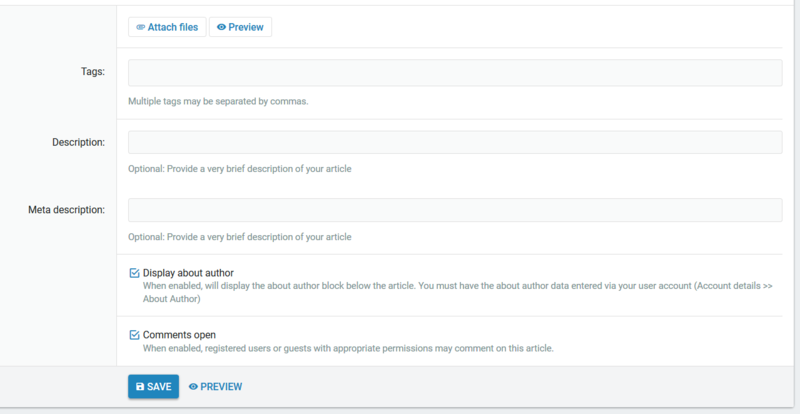 If you’re looking to write your own article, you can start by hitting ‘Add Article’ from the Articles Section. 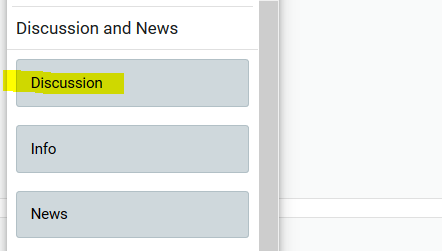 You first select which section your article will post in. 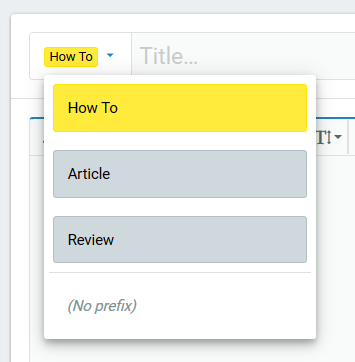 After selecting your desired section, you’ll be sent to the article creation page where you can create your article, using various markup tools and BBcode. Be sure to select the right Prefix for the article you’re creating, as it will help others find your content. A How-To is a tutorial or guide with bullet points or steps that helps to solve a common problem. An Article is a properly sourced piece of news about a current event or occurrence, and a Review is an analysis of a product or service. You also have plenty of options in terms of tags, descriptions, and whether or not you want to present an ‘About Me’ section or have your article open to comments. If you’re looking to see content from people or threads you follow, you can easily filter the forums by going to the ‘Your News Feed’ section. You can find it by going to What’s New > Your News Feed. The Members tab allows you to see the leadership board for the forum. From here you can see a general overview of the leaderboard and who has the most likes, messages, answers, articles, and more. You can also search for a specific profile post, see new profile posts, find a member, and see newly registered members of the forum. The leaderboard is, as the name implies, the page where you see who reigns at the top having achieved the most Best Answers overall or in a given category. This shortcut will send you directly to your Account Page, where you can see if anyone has posted on your page, make changes to your avatar, and check out your posts and stats. The Alerts tab sends you straight to your notifications in your Account Settings. As the name says, the Settings tab will allow you navigate directly to your Account Settings where you can quickly change your preferences such as the forum style, time zone, and email notifications. The Right Sidebar acts as another set of shortcuts for the forums. 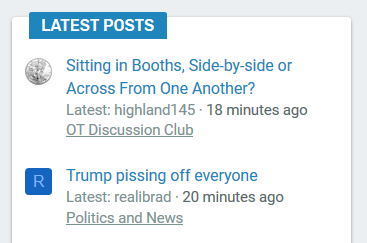 You can click on ‘Post a Thread’ and immediately jump to your desired forum and start posting. When you’re in an individual thread the ‘Post a Thread’ button becomes a ‘Reply’ button and that will send you immediately to the reply box at the bottom of the page. How do I collapse the right side bar? There is a three dot menu button next to the ‘post thread’ button near the top right of the page. Click on that to collapse the right side bar. 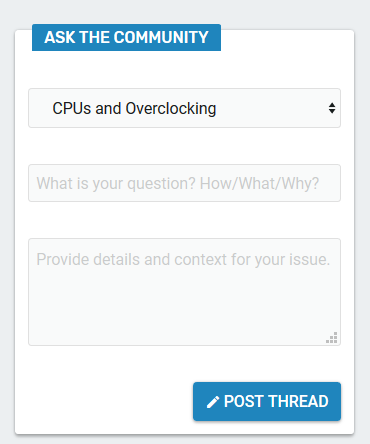 ‘Ask the Community’ is a feature allowing you to post into a specific forum without even going there! 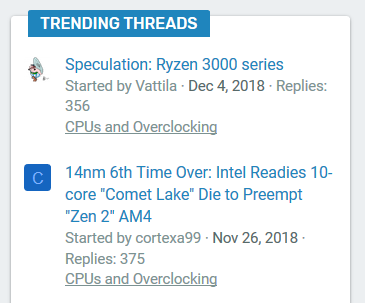 The Trending Threads section allows you to see which threads are the most popular by response frequency in the forum, and clicking a thread link takes you directly to the thread. Trending threads updates periodically, so check it often for the most lively discussions underway. ‘Share This Page’ is a section dedicated to sharing the page you’re on to your social media accounts at your discretion. If you find something cute or funny, hit the convenient share button. The latest Posts Section is dedicated to showing you the newest, most recent threads in real time! Clicking on any post you see in this section will send you directly to the thread. The new forums now have Two-Step Verification built in to allow you to secure yourself and your password. We recommend that you enable this feature. Two-step verification is great in stopping hackers and other n’er-to-do-wells from comprising your account. The Trophies system rewards members with virtual badges and points for meeting certain criteria. It is linked to the Title Ladder which replaces the traditional basic post count. Trophies are rewarded based on Reactions, Message Count, Best Answers, and quite a few various actions that members can perform in the forums. You can access your trophies and trophy progress through the Trophies tag in your Profile Page. Every so often, forum administration will need to provide notice of upcoming downtime, or an event or contest that is taking place. These notices will be visible in the upper portion of the forum which can be dismissed by clicking the X in the top right corner. In the bottom right corner as a post, you can hit “Quote” and “Reply”. The “Quote” option allows you to copy a post to quote in your own reply. This is useful if you’re quoting multiple posts in your reply to the thread. When you hit the “reply” option, it will automatically paste the post into your reply with a quote, allowing you to type a response without having to copy and paste or manually enter the BBcode to quote a post. Users who create Question type threads will be able to receive responses to those questions that can be voted on and selected as a Best Answer. Users can upvote or downvote a forum response and provide weight towards the selection of a Best Answer. The original poster (as well as staff) can select a response as the Best Answer, which is the response that solves the question in the most direct, efficient, and accurate way. Best Answers are accrued by users towards earning trophies. When you post a thread, next to the thread title is a Prefix drop-down. If you’re asking a question, you can set the thread to the Question prefix. A Question is a thread that can have one or more correct responses or a solution. If you’re looking to post a discussion thread, you can set the prefix to ‘Discussion’. A discussion has no right or wrong answer. The Reply box has a whole host of new features that will make formatting your response much easier. You can add images, link URLs, quickly bold, italicize, underscore, strikethrough, bullet point text and more with relative ease in the new editing box. Uploading images is exceedingly simple in XenForo! You have two options to embed an image into your post. In more common usage, you can link to an image by selecting ‘By URL’ and then copy/pasting the URL to your desired image into the field. You’re also able to save a draft of your own post. If you feel the need to walk away, or do some research on a subject before hitting ‘Post Reply’, you can always save your draft and come back to it another time. Simply hit the ‘Save Draft’ button when you need to. Emojis (aka Smilies) are a great way to spice up your posts and pepper emotional context (sparingly!) across the text that you provide in responses. There are a good number to choose from in the reply box. Reactions are quick “Like” style responses that provide fast feedback to your and other members posts. To set one, just hover other the thumbs up button you see at the bottom right of the post, and pick the reaction you’d like to use. Below the Reply box at the bottom of a thread is the Similar Threads module. Similar Threads shows relevant, likely related threads to the one that you’re reading where others are discussing related subjects. You can report a post while browsing an individual thread simply by hitting the ‘Report’ button on the post in question. This is useful when you spot spam, abuse, or other posts that violate the community guidelines. A window pops up allowing you to specify the reason for reporting the post. This will then alert Moderators to review the thread or post in question. Quick programming note here: the current timeline for the release of the new forum platform has not yet been announced, but will be shortly. This guide is posted in advance of that and the scheduled release of the new forum platform in order to allow you to familiarize yourself with many of the changes and new features ahead of time. When that timeline is known, an announcement will be made. Thank you for your patience, and here's looking forward to an incredible new community platform!